Phishing attacks, ransomware, and cloud storage are just a few of the cybersecurity concerns facing small business owners as we enter the new year. Hackers work tirelessly to outwit and infiltrate online protections. It is our job to stay steps ahead of these criminals to ensure that your information is protected and that your business continues to run smoothly. 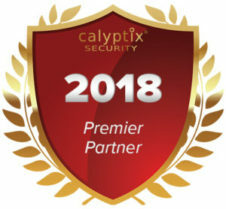 That is why we are proud to announce our continued designation as a Premier Partner by Calyptix Security Corp. This designation is based on the criteria of Canon Capital Computer Solutions meeting the Calyptix standard of commitment to superior IT support and services to our customers and for accelerating growth in network security services for the small and medium businesses we serve. This partnership with Calyptix gives us the advantage as we protect the key components of your business – payment systems, payroll, workstations – anything residing on your network, allowing Canon Capital Computer Solutions to give you even greater peace of mind and flexibility in your business operations. If you have questions or would like to schedule an assessment of your network, we are always available to you. Call 215-723-4881 or contact us online.